Comfrey is a real friend to the organic gardener and one of the most useful plants you can grow. Gardeners need to be growing this Russian variety (Symphytum x uplandicum) and not the one that commonly grows wild in Europe (Syphytum officinale) – which has been used for centuries as a herbal remedy. 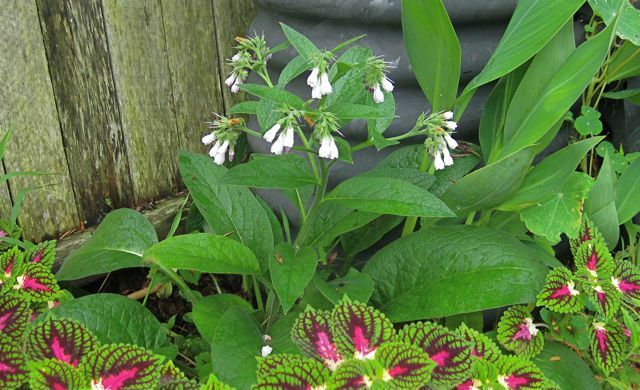 Russian comfrey is distinguished by large, hairy leaves and tubular, mauve flowers borne on tall stems (S.officinale is a a smaller plant with pink/white/yellow flowers). If you have ever grown borage you will see that it is a similar looking plant to comfrey in fact, they are in the same family. NOTE: Both the Russian and wild varieties have medicinal properties – it’s just that the Russian one is better for our use as organic gardeners – it’s a larger plant with bigger leaves. Herbalists grow comfrey for its many healing and medicinal properties – and have been doing so for centuries. A common wild plant native to Europe, comfrey is known as ‘knitbone’ for it’s usefulness in reducing swelling, bruising and for setting bones. It contains allantoin (a cell proliferant), in other words, it speeds healing. Farmers have traditionally used comfrey for animal fodder as it is rich in protein and minerals particularly, nitrogen, calcium, potassium and phosphorus. Chickens are pretty smart at knowing what’s good for them too and comfrey is the first thing they go for if they are foraging around the garden. TOP TIP: Plant comfrey around the chook house. How is comfrey used by gardeners? Comfrey has a large tap root that can grow to a depth of 3m and, for this reason it is a good idea to plant it where you intend to keep it and not move it around. This large root system does the job of ‘mining’ minerals from the soil up into the leaves – this is why it is such a fantastic ‘dynamic accumulator’. It has a high content of the three plant macro-nutrients NITROGEN(N), PHOSPHORUS(P) AND POTASSIUM(K). Comfrey is higher in nitrogen and potassium than farmyard manures, garden compost and about the same for phosphorus. Plants need nitrogen for healthy leaf growth, phosphorus for root growth and potassium to produce healthy flowers, fruit and seeds. (See previous post on understanding soils and pH) so it makes a lot of sense for organic gardeners to be growing comfrey – it does the work for you! Comfrey leaves have a relatively low carbon to nitrogen ratio. This means there is no risk of nitrogen ‘robbery’ when comfrey leaves are dug into the soil (which is what happens when you put fresh manures and lawn clippings on the garden). It also has a low fibre content which means comfrey leaves decompose rapidly. That’s why it makes such a fantastic mulch plant – it quickly revitalizes the soil – you can quite happily pile the fresh leaves on the soil and watch them decompose into the most fantastic, richest mulch you will ever see! Adding a few comfrey leaves to your compost heap will help it break down more quickly. Because it is so jam packed with nutrients it stimulates activity in the heap – that’s why it known as a ‘compost activator’. TOP TIP: Have one comfrey plant next to your compost heap so you always have a few leaves to add every time you put in a load of something else – like kitchen scraps – it helps to break it down quicker. 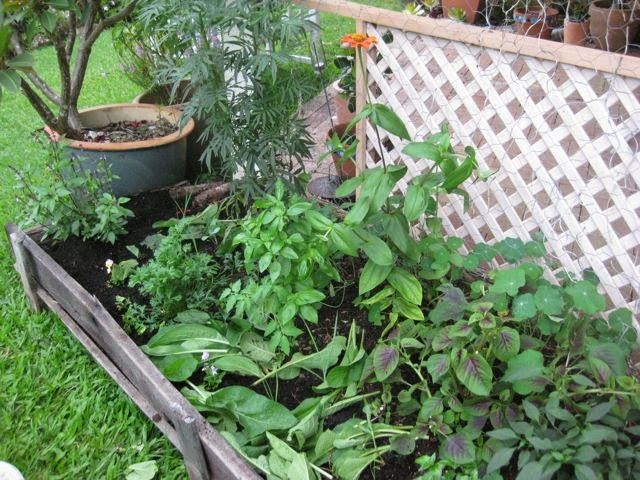 Plant it in the ‘dead’ spots in your garden where is isn’t taking up useful garden bed space. Divide large clumps at any time of the year. Beware – the smallest root will produce a large clump. It also grows very rapidly – one plant giving up to 2.5kg per cut then regrowing to give up to ten cuts per year. Anyone can grow comfrey and is easy to establish on most soils. Comfrey rarely suffers from any serious pest and disease problems. And You Thought Gardening Was Boring? Researching topics leads me to trawl through the dusty shelves that is my library and I came up with this from a book By Robin Page called ‘Cures and Remedies the Country Way’. And I quote. “Marriage – once again this is not an illness (although some would disagree)………….. Girls – I would not rely on this if I were you but, I hope the rest of it has been useful!